All too often we will see folks bring in what they believe to be their water-resistant watches only to have our watch technicians find out that it is too late and that moisture has already breached the watch movement. 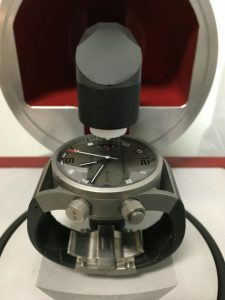 If not dealt with immediately, the moisture can attach itself to tiny watch parts within the case and movement, resulting in corrosive rust formation and unsalvageable parts. There is a certain art and science when it comes to the water resistance of a watch case. There are many components and areas of water breaching including the gasket and seals, watch crystal, crown and tube, watch bezel, case back, case buttons, and even the case itself. 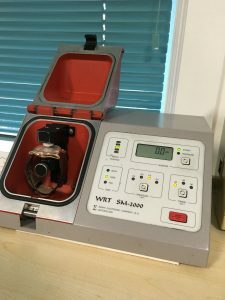 At Geneva Watch Repair, we have state-of-the-art water pressure testing machines and the technical knowledge required to make sure that your timepiece meets water resistant specifications. All watches are tested for water resistance before and after repair or complete servicing. We have multiple state-of-the-art water pressure testing machines including dry and wet pressure testers suited for different phases of the water resistance process. Water resistance of a watch case is checked multiple times throughout the complete servicing process with our proprietary water resistance protocol. You can be sure that each step of the way, we will be checking for moisture breaching areas and making sure that your timepiece is safe, secure and fit for your showering, swimming, or diving needs. Please note that there are many watches that require multiple gaskets and watch parts in order to make the watch water resistant. Estimates for water resistance are based on parts, gaskets, and labor required for our skilled technicians to seal breached case areas and perform multiple leakage tests until watch is water resistant to specification.